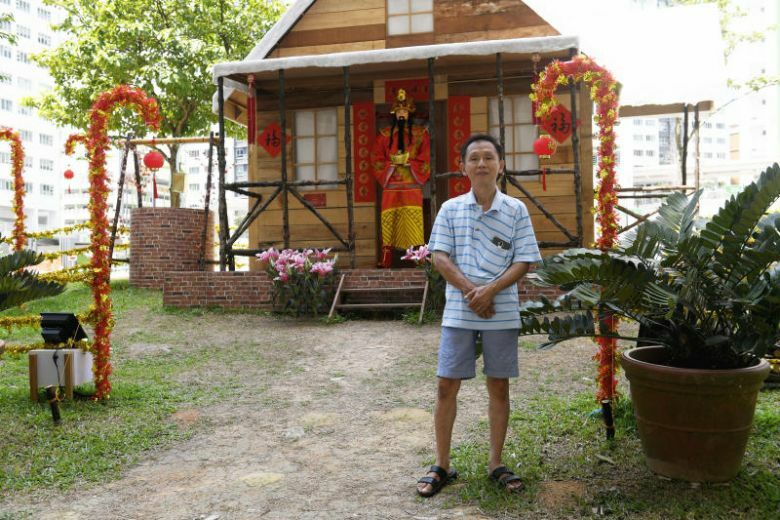 SINGAPORE – A Christmas cabin that caught the imagination of Woodlands Housing Board residents has undergone a transformation just in time for Chinese New Year. The “snow topped” Christmas log cabin in front of Block 178 Woodlands Street 13 from December now sports decorations such as Chinese couplets, Gods of Fortune, and Chinese lanterns. Mr Tan Koon Tat, 58, told The Straits Times on Monday (Feb 4) that he took about a month from Christmas to make the changes. “Time was tight, and I had to find different pieces of decorations and that was quite difficult. But I still managed to do it,” said Mr Tan. The Woodlands resident has been putting up festive decorations in the neighbourhood for over 10 years, including for Deepavali, Hari Raya Aidilfitri and Christmas. “While I was working on (the Chinese New Year cabin), some neighbours chipped in to help when they came by, helping with the odd job here and there,” said Mr Tan, who is a carpenter by trade. A neighbour in the next block helped to write the Chinese couplets, which were then put up on the front of the cabin. Last year, he transformed a Christmas sleigh into a Chinese New Year-themed sleigh. For this year’s cabin, in conjunction with the Year of the Pig, he added a pig figure dressed as a God of Fortune, alongside a traditional human God of Fortune figure. “This gives people two options. If they don’t want to take pictures with the pig, they can take with the human God of Fortune,” said Mr Tan. He had also sought feedback from Malay residents before constructing the pig decoration, and showed them some pictures of what he intended to put up. Unfortunately, an ingot that the human God of Fortune figure was holding was stolen on Sunday. The ingot was still there when Mr Tan left his home at 3pm. But when he returned in the evening around 8pm, it was gone. “Never mind, I will just buy a new one to replace it,” said Mr Tan. Ms Sharon Ng, 54, a beautician who lives in a neighbouring block, was full of praises for the decorations. She particularly liked the wishing well feature, and said the decorations contributed to the festive atmosphere.